We've looked into providing an "app" for iPhones or iPads that would take one directly to the forum, but have found it's very easy to set one up yourself. It should take less than a minute to do. Safari is the web browser built into iPhones and iPads. It has this feature built in. 1. Open Safari and go to the forum. 2. Find an icon that looks like a rectangle with an arrow (or a plus sign on older models). On an iPad, it should be directly to the left of the location window where you'd type in a URL. On an iPhone, it should be at the bottom of the screen. 3. Click on that icon and you'll get a list of choices. 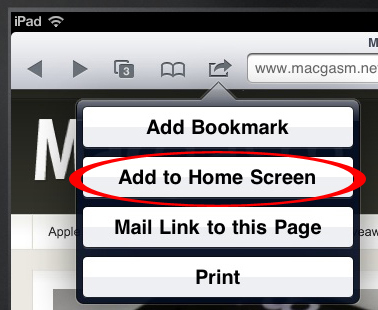 Choose "Add to Home Screen". 4. You can call it whatever you like, then click on the "Add" button. That's it! You can drag the icon to wherever you want it. This is actually quicker and easier than downloading and installing an app. Other mobile devices and smart phones which connect to the internet should have similar features. If you have one and know how to do this with it, feel free to post instructions for it here.